A variety of edible thistle, the Artichoke is one of the real joys of summer in both flavour and fragrance. Though cultivated in Britain – particularly in the South – the heartland of the Globe Artichoke is the Mediterranean, where it grows wild and in prodigious quantity. Indeed, the artichoke is best known for its use in Italian cuisine. But before we get onto all of the clever things that can be done with artichoke hearts, let me show you how to prepare the vegetable and enjoy its meaty leaves. There are numerous ways to cook your over-endowed thistle, but steaming is probably the most popular. However, since my kitchen isn’t currently blessed with a steamer, boiling will have to do. Many of you will, no doubt, chastise me for “boiling all the flavour and nutrients away”, but it makes very little difference and life’s simply too short! However, if a steamer you possess, making use of it for 30 minutes should suffice. Artichokes are – on their own – full of flavour and don’t need much of a leg-up over the culinary wall, so to speak. However, two cloves of garlic and the juice of 1 lemon in your boiling water will complement that base flavour nicely, allowing your thistle to… blossom. Add to that a simple dip of extra virgin olive oil, emulsified together with an extra twist of lemon juice and you’ll find yourself reclining in food heaven. This stuff makes such an exceptional starter or nibble. Trim the outer layer of leaves from the artichokes and cut the stem down to 1-2cm. Place them in a large pan. Top the pan up with water until halfway up the artichokes. Add the garlic, salt and most of the lemon juice, leaving a smidge for the dressing. If steaming follow the same process, only steam the artichokes. Bring the water to a gentle boil, pop the lid on and cook for 30-40 minutes, until soft. Meanwhile, beat together the olive oil and remaining lemon juice. Once cooked the artichoke is ready to eat. The best way of doing this is to peel each leaf from the thistle, dip it in the dressing and “scrape” the meaty part of the leaf with your teeth. Next, get to the hearts of your artichokes by removing any remaining leaves and the furry centre. Snap off the remnants of the stem – the heart is the soft, fragrant, slightly grey part right in the centre. These are delicious on pizza, with pasta or even as a dip. Cost: As you can see, this recipe is incredibly simple. Simple recipes are usually inexpensive, there is no difference here. 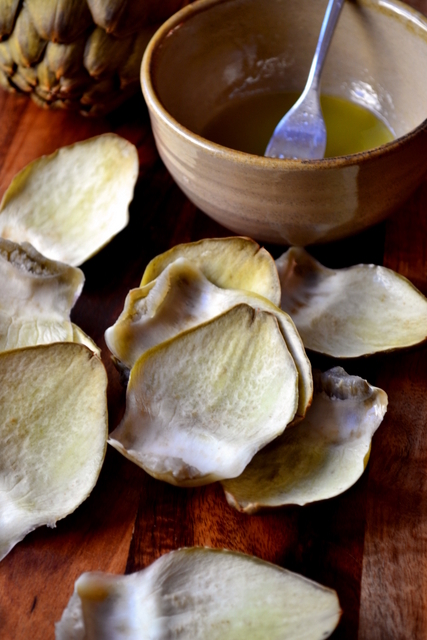 Globe artichokes can be bought for around 50-60p each at this time of year, with the other ingredients coming in well under 60p themselves. As such, you can enjoy this smashing starter or snack for as little as £1.50. Great photos and cooking advice. Artichokes are wonderful. I once cooked baby artichokes, they were thin and tender like asparagus, and I just sautéed them butter. That sounds wonderful – I’ll have to keep my eyes peeled. Appreciated reading this as I love artichokes and our season Down Under will begin in about a month. Altho’ I steam almost all my vegetables, somehow did not realize one could steam the big globes as well and have to try: I am afraid I have always boiled. Do it exactly the way you do, but admit to usually have cut the top quarter or so of the globe off and discarded it ere treating it your way. Huh, wasteful 🙂 !! Boiling is just fine – I only ever boil. You can’t avoid waste with artichokes unfortunately. 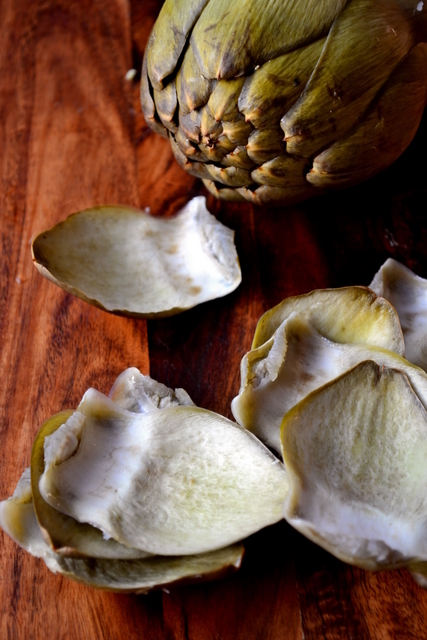 There is nothing more delicious than an artichoke! Sometimes I make several of them, pour a glass of wine, sit and enjoy. 🙂 Love this “how to”! 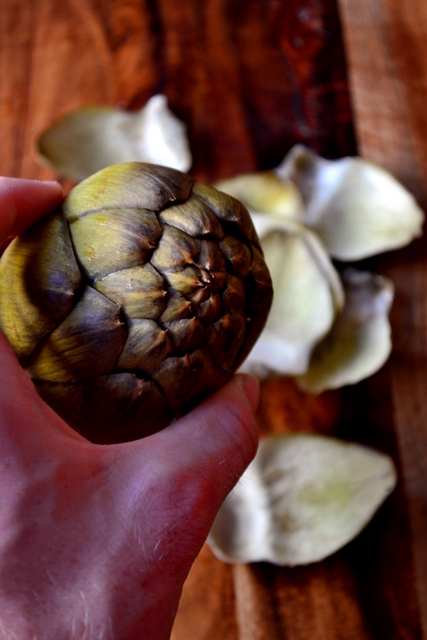 A perfect description and demystifies preparing artichokes. Quite right! Thank you, Karista! I haven’t cooked fresh artichokes in a while. Thanks for the reminder to put them back into my repertoire. I must admit to loving artichokes and am fortunate here in California to have a cheap and plentiful supply during the season. I trim the bottom flat, hack off the top spiky bits, put it in a glass bowl (seated on the heart end), add about 1″ of water at the bottom, cover with plastic wrap and microwave for 7 minutes. I’ve been cooking them like this for years – since I read those directions on the tag that was attached to the artichoke. I figured the artichoke knows best. Yum! ‘The artichoke knows best’ – I like that! I don’t have a microwave, otherwise I’d try it! Thanks. That’s nice of her 🙂 – yes, they’re very, very simple! I did this once last summer, it was so delicious. Tried it again a few months ago but I don’t think I’d chosen the best artichokes to work with–yours look great! That’s a shame – when you get it right, they’re so delicious. I’ll definitely check it out for future reference – thanks! I haven’t bothered to cook an artichoke in many,many years.You have inspired me to pick some up on the next shopping trip. Oh you must – a seriously good and tasty ingredient. My introduction to artichokes was a failed attempt by my mother. Since then I have had them pickled, fried with fresh Parmesan… and LOVE them, but have been hesitant to try cooking them. 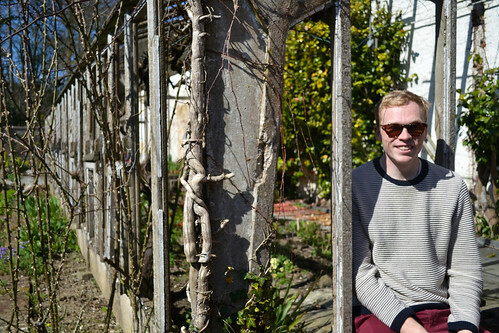 Your blog post is just the nudge I needed. Thanks! Yes, you must! So simple to prepare and absolutely divine.